Herbal bath powder is easy to make at home, economical and harmless as it is natural. 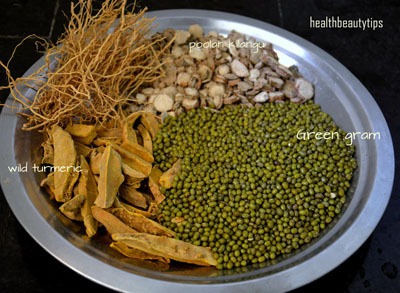 The ingredients needed for making this herbal powder are easily available in any nattu maruthu shop or Ayurveda shop. I am a huge fan of natural products and love to make my own herbal bath powder. I use this herbal powder not only as a face wash or bath powder but also as a face pack and as a scrub. After I started using this herbal powder, I noticed positive changes in my skin. My skin became soft, smooth and blemish free. This powder can be used as a substitute for soap. Regular use of this powder makes your skin soft, smooth and blemish free. As it is made using natural products, it does not strip your skin of its natural oil. It can be also be used as a face pack . I use it with rose water as I have an oily skin. Persons with dry skin can use it with curd/plain yogurt. This powder makes a good natural scrub. It can be safely used on babies. Dry everything together well in the sun for 2 days. Then get it ground in the mill to a fine powder. Store in any air tight container at room temperature. If you do not have flour mill near your place, powder it in a mixie, sieve it and store it. It stays good for more than 6 months. Avoid using wet spoon. Wild Turmeric known as kasturi manjal in Tamil is an aromatic turmeric used specially for beauty purposes. It is used to cure many skin diseases. It also reduces facial hair growth. (This turmeric does not leave a yellow tint on the skin). Pulan kizhangu is also known as Seemai Kichchili Kizhangu in Tamil and “Kapur kachri” in Hindi. It has antiseptic properties and a nice pleasing fragrance. It is an aromatic grass which has antiseptic and cooling properties. It is used to treat acne, rashes and sores. Neem leaves have antibacterial and anti-inflammatory properties. It cures many skin problems. 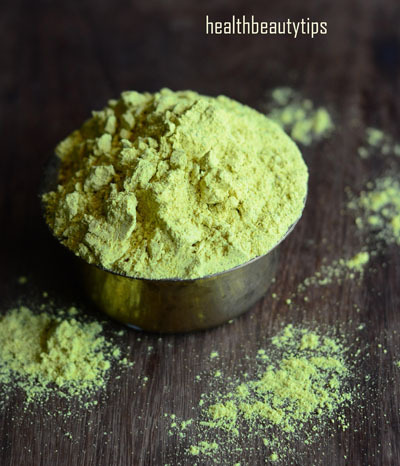 How to use this Herbal Bath Powder – Mix needed quantity with little water to make a paste. Use this paste instead of soap. You will definitely find positive changes within a month of using this bath powder. You will be surprised to see your skin soft, smooth and glowing.